One of the topics I’d heard other independent authors talk about a lot was auto-responders, but for years, I put off actually setting up one of my own. Being an indie author means we’re constantly juggling demands and having to prioritize. I didn’t understand how valuable an auto-responder could be, so it never seemed to jump to the top of my list. I was also intimidated. I didn’t know what to write in my auto-responder. This year, I tackled it. I’m not going to go into why I think that might be the case. There are plenty of other resources that will do that for you. What I wanted to do was hopefully make this process less intimidating for others so that no one else keeps putting it off like I did. An auto-responder or automation sequence is a series of pre-designed emails that are sent to people when they sign up for your newsletter.The emails are sent at whatever interval you decide, or they can be triggered by specific actions that your subscribers might take. Basically, what we’re doing is using these automated emails to build a relationship with new readers and to help them feel more engaged with us and our content. 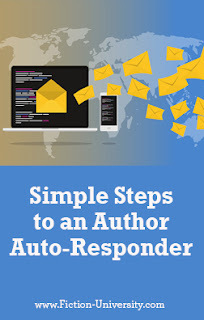 So, in the rest of this post, I’m going to quickly walk you through what’s in each of the emails that my pen name’s auto-responder sends out. That way, you’ll have a template to use for your own emails. Before I give you my template, I want to add an extra tip because it’s foundational to every email I write for my readers. Email 1 (Sent 1 hour after signup) – This is the simplest email. I remind them that they’re receiving this email because they signed up to join my newsletter, and I give them the link to whatever sign-up gift I offered. In the case of my pen name, they get a prequel novella that’s connected to my flagship series. Email 2 (Sent 2 days after signup) – I check in with them to make sure they got their freebie. You might wonder if this step is really necessary, but I routinely have a full 10-20% of people click on the link in this email. Since I want to get them reading my work, that’s an important enough percentage to me. You’ll have to decide for yourself. I don’t want to lose people because they somehow missed my first email. Email 3 (Sent 9 days after signup) – This is the email where I introduce myself a bit more and tell them about the type of books I write. I feel this is an important step to help people decide if they want to stay on my list or not. I tell them exactly what they should expect from my writing. I also give them a recipe that’s related to my flagship series as my “what’s in it for them” piece. Email 4 (Sent 16 days after signup) –This time I tell them more about my flagship series. My hope is that by now they’ll have read the freebie, so I want to interest them in the main series and make it easy for them to move into the first book (if they haven’t already). I include some interesting, fun tidbits, so that there’s value for them in reading the email. I don’t hard sell them on the series. I don’t want to turn them away by being too salesy at this point. There you have it. So far, this simple sequence has yielded good results for me and no spam complaints. Do you have an auto-responder set up? What other tips or bits of advice would you give to someone setting one up for the first time? Most people would die to save the ones they love. But would you live a life worse than death instead? In 1500s Scotland, Ceana Campbell, the unwanted daughter of the village drunk, accidentally does the one thing every sane person knows not to do. She angers a fairy. As punishment, the fairy forces her to make three wishes—and the man she loves will suffer the opposite of whatever she wishes for herself. To spare him, she takes on the cursed side of the wishes and ends up erased from the lives of everyone who mattered to her and doomed to fail at everything she tries. At first, the sacrifice seems worth it. What she didn’t count on was how rescuing one person she loved would put another in jeopardy. Now, to save the life of her little brother, she must convince a man who no longer remembers she existed to help her hunt for someone powerful enough to break a curse of the fae—a feat which could put them in the middle of a supernatural civil war, where an angry fairy will be the least of their problems compared to the monster they’ll face. Thank you for the auto responder template. A quick tip about your book section... make the image for Cursed Wishes a link to the amazon page as well. I initially clicked on the image thinking it would take me to the amazon page. When it didn't work then I searched for the text link. Most users will click on the image first.